10 Things Your Service Dog in Training Needs to Know – ComeHereBoy! If you’re lost as to what your dog needs to be able to do to start training to be a service dog, you’re definitely not the first! I wasn’t sure where to start when I was looking into owner-training a service dog. What did my dog need to be able to do for me to take them into a public place? Since there are no specific rules to how a service dog needs to behave, other than they can’t be “disruptive” and must be housebroken, it can really be confusing as to what your dog should know before you start special service dog advanced and task training. A simple way of getting your dog ready to be well-behaved in public and ready to be trained for service dog tasks is to teach them these 10 basic obedience tasks. These 10 tasks are taken from the CGC test. The CGC test is put on by the AKC and is an actual certification, but certification is not required for your dog to be a service dog. This is just a great measurement of how well your dog is suited for being in public. Your dog will need to sit nicely and wait while a friendly person approaches you and shakes your hand and speaks to you briefly. For this test, your dog will sit nicely as a friendly stranger pets them for a few seconds. This test is to simulate being at the vet. A stranger will briefly check your dog’s ears and front feet to see if your dog will behave while being examined. Can your dog walk on a loose leash? This is probably one of the harder items on the list! Your dog needs to be watching what you’re doing as you walk along a pre-plotted course. You’ll have to make at least one right turn and one left turn as you walk and your dog needs to follow you without pulling. Your dog doesn’t need to do anything fancy like sit when you stop, but they do need to stop walking when you do. In this test, your dog will need to walk nicely on lead past at least 3 people. He can show interest in the people, but shouldn’t act shy, crazy or jump on them. When you tell or motion your dog to “sit” or “down”, they should be able to do either and then they need to hold that position until released. Your dog will be put on a 10 foot leash and you will ask him or her to come. They should come to you and allow you to grab their collar without a fuss. In order to be a good service dog, your dog will need to be able to pay attention to you despite other dogs being nearby. This test is performed when you and another person with a dog walk up to each other from 20 feet away, stop, shake hands and exchange pleasantries and walk on. The dogs should act politely towards each other. This is basically a test to see how your dog reacts to loud things. The evaluator drops something that is loud, such as a chair or a bowl, and marks how your dog reacts. They can act slightly startled, but should recover quickly. They can show calm interest in the item, but should not react shyly or aggressively. A person should be able to hold your dog while you go out of sight for 3 minutes. Your dog can show slight distress and get out of position, but shouldn’t bark, whine or pace the entire time you’re gone. Once you’ve got these 10 basic training tests down, you’re ready for advanced training with your service dog! 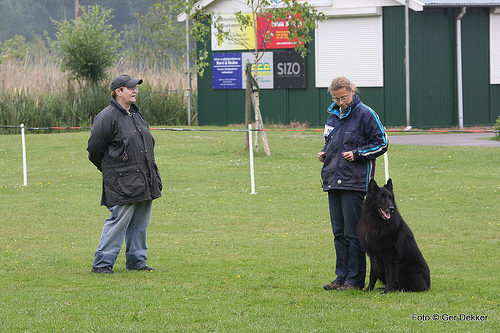 Which one of these obedience tests do you think will be the hardest for your dog to learn? Previous PostPrevious Where Do I Get a Service Dog? Next PostNext How Do You Know if Your Dog Would Make a Good Service Dog?